Over the years we’ve owned a variety of bicycles, most of them suitable for touring. It seems extravagant to have so many bikes but each one has its uses, and since we don’t have a car we don’t feel too guilty about our extensive collection. In recent years, we’ve also added a couple trailers to our stable of touring bikes, as we make the transition from touring as a couple to touring as a family. When we first started bike touring in 2006, we ordered custom built steel bikes from British frame builder Robin Mather. These are one-of-a-kind bicycles. We’ve been around the world on them, rebuilt them in 2011 and continue to ride these classic, beautiful touring bikes. You can see the technical specs of these bikes and read about how we rebuilt them after our world trip. Over 10 years after we bought our steel-framed touring bikes from Robin Mather, they’re still serving us well. After our world trip on our steel-framed bicycles, we moved to the Netherlands. During this transition, we had to leave our treasured steel-framed bikes in Canada for about two years. We still wanted to tour, however, so we invested in Dutch touring bikes from Santos*. 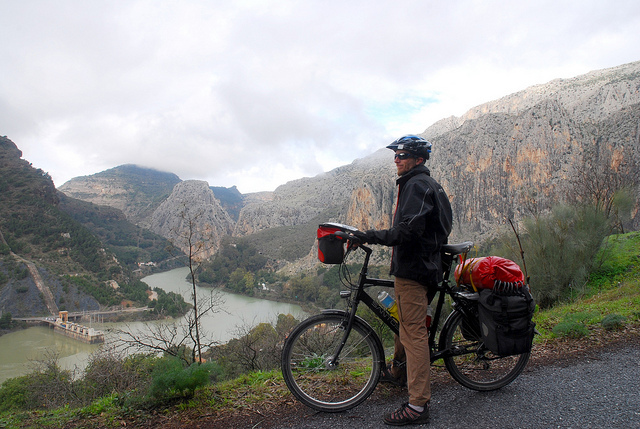 Andrew and his Santos Travelmaster 2.6 Alu touring bike, which he rides regularly. With hydraulic brakes and aluminium frames, these bikes were noticeably different from our steel-framed touring bikes but no less enjoyable to ride. Here’s our review of the Santos Travelmaster bikes (written not long after we bought them). *Friedel eventually sold her Travelmaster, to make way for our ‘family SUV’, the Circe Morpheus Tandem. We live in Europe and often use the train to get to the starting point of a bike tour. Taking a full-sized bike on a train is possible but not without its challenges. A lot of our riding also consists of urban commuting, so it’s really handy to be able to take a bike on a local tram. If you want to fly with a bike, it’s possible (with careful packing) to include a folding bike as part of your luggage allowance, saving big on airline fees. With that in mind, we bought a Brompton folding bike in 2011 and followed that up with a Dahon Speed TR in 2012. In addition to our “normal” touring and commuting, we took both to Cuba for a month of touring. 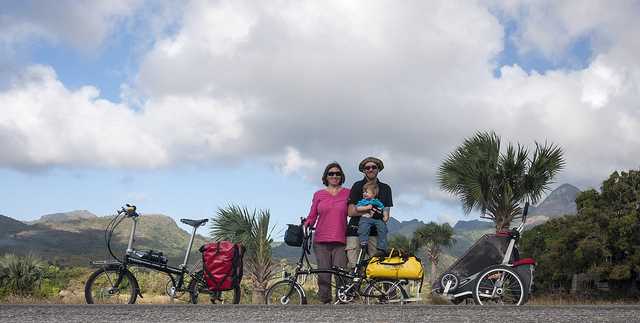 On tour in Cuba with our Brompton and Dahon folding bikes. Although both fold, they are very different bikes. Briefly: the Brompton is great if you want to do a lot of commuting with a little touring on the side. It’s so easy to fold but is slightly less suited to carrying luggage and tackling steep hills. The Speed TR on the other hand is a super little tourer. It feels very solid and is all set up for touring but the folding is more awkward, so it’s the reverse of the Brompton: great if you primarily want to tour, with a bit of commuting thrown in for fun. Both bikes are capable of towing the Chariot Cougar 1 trailer, which allows us to be on-the-move as a family. This gives great flexibility. A folding bike can go on any train, any time without extra fees. Technically a trailer isn’t allowed on most trains in Europe but the Cougar 1 trailer changes quickly into a kid’s stroller. As long as you call it a stroller, you’ll have no trouble at all. When our family expanded to two children, we needed once again to re-think our transport options. 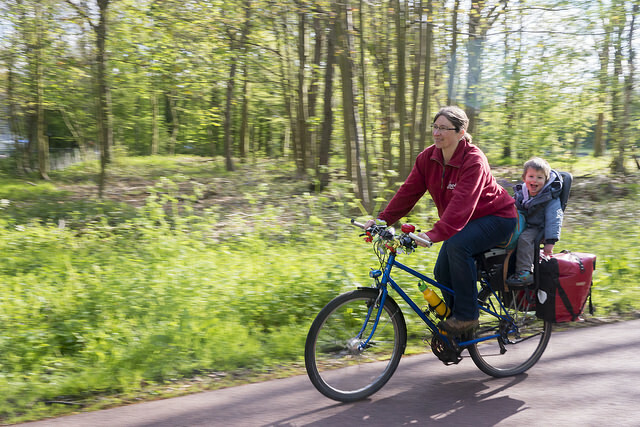 Could we find a bike that would comfortably carry two kids, handle touring as easily as commuting and (ideally) allow at least one of the kids to actively participate in cycling? We found our answer in the British-made Circe Morpheus, complete with a Rohloff hub. Here it is, set up to carry two kids and luggage. Our youngest son has cycled on the front since he was about 3-1/2 years old, though he only really had the strength and focus to cycle any great distance when he was 4-5 years old. Our Circe Morpheus, set up to carry two kids and luggage. If you live in the Netherlands and have kids, it’s almost obligatory to have a bakfiets! Although they aren’t really suitable for touring (you could, perhaps, use them for trips to a nearby campsite), they’re ideal for commuting around town and carting several kids around at once. Ours is the Cargo Bike Long from Bakfiets.nl and we bought it second hand. 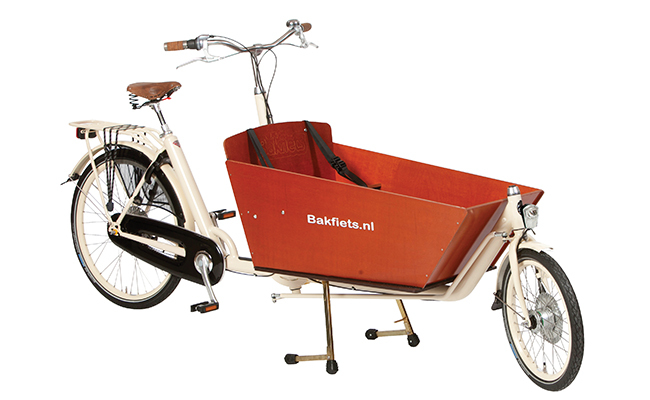 The Bakfiets.nl Cargo Bike is a great way to ferry multiple kids and shopping around town. When our son Luke was born, we had to re-think our packing strategy. As a baby, Luke could simply travel in his Chariot trailer (and we could still carry our panniers as we’d always done). By summer 2014, however, we no longer had a baby. We had a toddler who was taking up increasingly more space. His back seat filled the rear rack and carrying back panniers was no longer an option, so we invested in the Radical Designs Cyclone IV Trekking Trailer. We love it! Read our full review. Friedel and Luke, carrying the Radical Design trailer. When Luke was born, like every other family out there, we needed a stroller. At the time we were living in a small apartment so we placed a high value on things that could do more than one job. Happily the Chariot trailer fit that brief perfectly. It’s both a stroller and a bike trailer, and switches seamlessly between the two modes. We also needed a trailer to carry Luke when he napped or during bad weather. This trailer isn’t cheap but it’s very robust. We used it extensively for 3 years, both for daily trips around town and for longer bike tours, and it’s still in great shape and ready for kid number two! Probably too late for you. In March we were touring Cuba. I would say there would be no chance of bile hire in Cuba as I could not even buy a replacement snorkel. There are very few goods available in this wonderful country. I would consider a folder and if you do not like it sell it on your return. Whatever you do go to Cuba it is really a safe and good place. 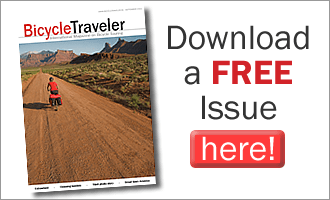 Are you camping or staying in AirBnB hotels? There are apparently numerous options throughout the island. It looks like an amazing trip. There are still few vehicles on the road, so road safety shouldn’t be too much of a problem. Good luck to you. Our family is also four, with one baby and one toddler. I have just come across Circe bikes and I am enamoured with them! I am trying to decide between the circe Morpheus that you have. It seems to have one key advantage: the child sits up front and gets a view. We hosted a family touring on them last summer and they said it was a big plus. The other option, the circe Helios – a conventional tandem – has another advantage: you can pay extra to get a folding mechanism and get a bike trailer which turns into a suitcase to carry said tandem on a plane! Due to the fact that we move country quite often, I am erring towards the foldable Helios, despite the fact that I think the Morpheus would provide a more enjoyable cycling experience. Did you guys go through the same decision-making experience? May I ask what made you opt for a recumbent tandem Morpheus in the end? This is a unique style of writing! I really love the article as it’s written like a brief story! I tried to make my articles a little bit creative in explanation. But, perspective is road bike. Six months later and I think I am going to opt for the Morpheus. I think it will just be more fun for my son to be upfront. One big question remains. Can you get it on a plane? I see it is just within standard baggage weight and slightly over 2 meters long. Have you tried this yet? Hi Owain, sorry to have never replied to your first question. Life is just too busy for us at the moment. How old is your son? Luke is now 4-1/2 and can pedal a reasonable distance (40km) without getting tired of being on the bike. When we started a year ago, we could only go a very short way but he’s grown so much in size and strength in recent months. Opted for the Morpheus because, as you said, he sits up front and it’s a great view! Haven’t tried to get it on a plane yet but I reckon other tandem riders do it so it must be possible. Another option would be the Hase Pino but it is more expensive. The advantage of the Pino is that it comes with a freewheel in front, whereas the Morpheus does not with the kiddy crank. That was an issue with us as Luke didn’t always want to pedal and there is no obvious place to put his feet if he is not pedalling but we’ve worked our way through that awkward stage now. I have plans to write a full review of the Morpheus for family touring. Just need to take a few photos and find the time! I sensed his impatience to be more involved which is why I like the Morpheus so much. I have checked out the Pino as we hosted a family travelling with them but I have opted for the Morpheus as it is cheaper and looks a bit more solid, and Circe have been so helpful. I didn’t realize there was no freewheel with the kiddy crank, which is a shame, but good to know in advance. As you say, where there’s a will there’s a way, so I’m sure travelling with one by plane must be possible. I really look forward to your review of the Morpheus, but I know that finding the time is never easy! Leave a Reply to Eric flint Click here to cancel reply.